You’ve heard the rave about Korean Panax Ginseng, but how much of the proclaimed benefits are actual truth? 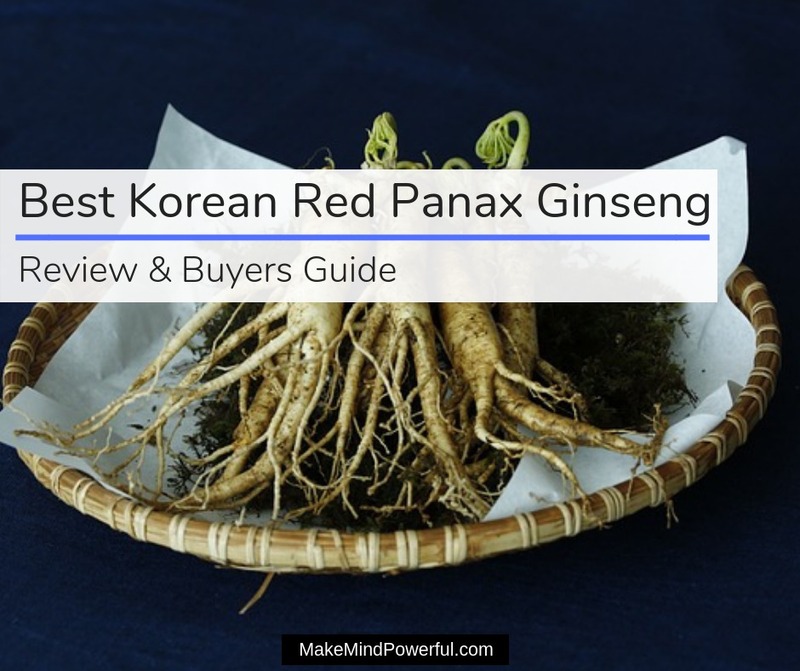 Read this guide on the best Korean red Panax ginseng to find out. 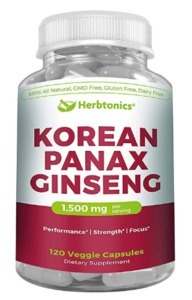 If you need just the strongest Panax ginseng supplement available, check out Auragin Korean Panax Ginseng tablets made from 100% ginseng root powder. Ginseng is is a plant where it’s root is valued for its medicinal properties. Panax ginseng is a species of the ginseng family. Also known as Asian ginseng, Chinese ginseng or Korean Red ginseng, it is native to the Korean peninsula, northeast of China and far east of Russia. Due to its immense healing properties, Panax ginseng is commercially cultivated where they are harvested after five or six years. Here are some reasons why you should consider taking Panax ginseng supplement. 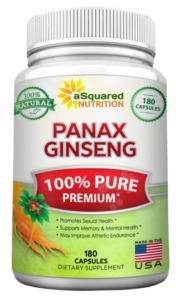 Panax ginseng is sometimes being labeled as an adaptogenic herb where it helps the human body to cope with stress. Its medicinal properties are attributed to ginsenosides, a major compound in the Panax ginseng. Although there are limited studies, Panax ginseng has been used traditionally to promote emotional wellness. According to researchers in Korea, Panax ginseng exhibits a stress-relief property that is likened to antidepressant drugs. Testings done on animals have demonstrated that Panax ginseng helps to decrease stress level, and reduce the likelihood of depression. The neuroprotective effect of ginseng is also believed to improve anxiety, according to a study by Winona State University. Men suffering from erectile dysfunction could benefit from taking Panax ginseng, as numerous studies have suggested strong evidence for its benefit. A systematic review of a number of randomized clinical studies in 2008 indicates that taking Panax ginseng benefits psychogenic erectile dysfunction. Another clinical study that involves 119 participants further validates earlier trials. The participants were given Korean ginseng berry tablets for 8 weeks. Results show improvement amongst the participants by the end of the trial. Both young adults and middle age individuals can benefit from Panax ginseng when it comes to cognitive performance. This is suggested in an animal model study conducted by Korean researchers in 2012. Alzheimer patients too, have shown improvements in symptoms when Panax ginseng is prescribed. A clinical study conducted by the Seoul National University Hospital indicates the clinical effectiveness of Panax ginseng in 58 patients with Alzheimer’s disease compared to the placebo group. There is also strong evidence that suggests that Panax ginseng is effective in keeping type 2 diabetes under control. A systematic review has found that 8 randomized clinical trials have demonstrated the positive effects of Panax ginseng in improving glucose control and insulin sensitivity in diabetes patients. Another study that involves sixty participants between 20 to 70 years old in Korea also concludes with the positive results on diabetes control after Panax ginseng was prescribed for 12 weeks. While there is yet to be conclusive evidence, early studies have suggested that Panax ginseng may have anti-cancer properties. Researchers believed that the influence of Panax ginseng in treating cancer lies in its ginsenoside stereoselectivity and double bond position. If you’re unsure of the right dosage, consult your doctor before taking Panax ginseng. It is not recommended to take Panax ginseng for more than 6 months continuously as it may cause hormone-like side effects. The most common side effects reported while taking Panax ginseng is developing insomnia. Pregnant and breastfeeding women should avoid taking Panax ginseng as it is believed to lead to serious complications. Children, toddler, and babies must also not take Panax ginseng, as it is likely to be unsafe. Individuals who suffer from the following conditions should avoid taking Panax ginseng as it could cause further complications. Bleeding conditions – Panax ginseng can disrupt blood clotting process. Heart issues – Panax ginseng can cause fluctuation in heart rate and blood pressure in initial use. Diabetes – If you’re already on diabetes medication, Panax ginseng can further decrease the sugar level. Insomnia – If you struggle with sleep, Panax ginseng can aggravate sleep disorder. Hormone-sensitive conditions – that may get worse by Panax ginseng’s estrogen-like compound. Organ transplant – Panax ginseng may boost the immune system and reject the new organ. Schizophrenia – Individuals suffering from this condition may be aggravated when taking Panax ginseng. 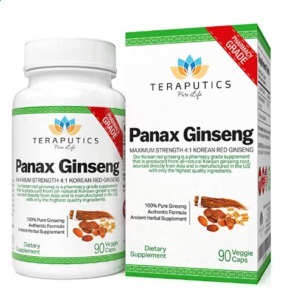 With the immense benefits offered by Panax ginseng, you’ll be tempted to get one right away. However, it’s prudent to take the following into considerations before picking one. Source – Ensure that the labels state that the Panax ginseng is harvested from Korea and certain parts of China and Russia. Strength– Panax ginseng supplements are available in different strength and you’ll want to get the right ones that match your requirements. Physical form – You can take Panax ginseng in different forms, including capsules, tincture, powder, and liquid. Manufacturer – Only buy Panax ginseng supplement from vendors who adhere to strict quality control in manufacturing practice. You can buy Panax ginseng from health supplement stores or get it from online retailers. If you’re keen on reading reviews and comparing major suppliers before making a decision, Amazon is a great choice. There are hundreds of products offered by various manufacturers and they are definitely not equal in quality. Here are some of my recommended Panax ginseng supplements after doing extensive research on each of them. 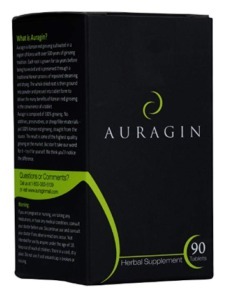 Auragin is a health supplement company that niches in delivering top-notch ginseng products. It sourced its ginseng roots from a farm deeply hidden in a remote valley. Ginseng harvested from this farm has an amazingly high ginsenosides content that is unknown off in other locations. If you need an extremely potent serving of Panax ginseng, the powder in these tablets contains an extremely high level of ginsenosides. Not only that, the tablets are made of pure ginseng root which has a superior effect compared to extracts. You’ll enjoy unmatched benefits of ginseng with an uncompromised natural ratio of the ginsenosides. Each of the ginseng used is grown for at least 6 years before they are harvested. The roots are subjected to steaming and drying to turn to produce red ginseng. After grinding the roots into powder, only the top 30% in terms of potency are used in producing the tablets. Pure ginseng powder, not extract. Only the top 30% of ginseng powder is turned into tablets. Not effective for some customers. NutraChamps prioritizes its mission of empowering individuals to achieve health, wellness, and longevity in life. 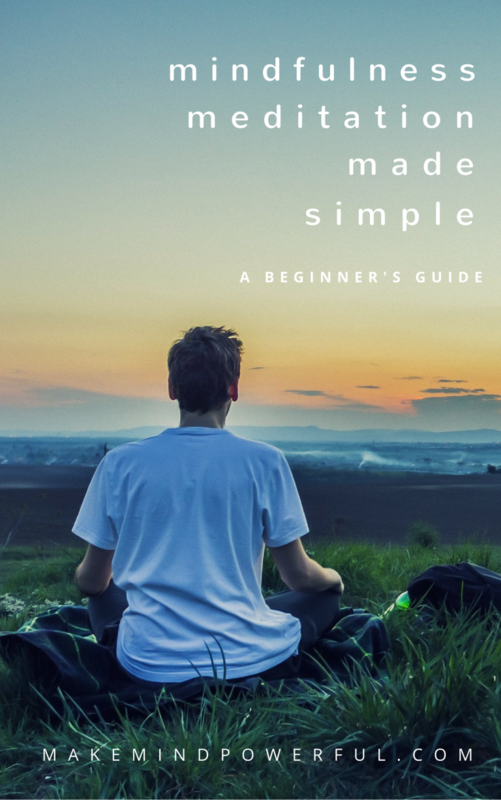 It combines the healing ability of natures with modern science to produce high-quality nutritional products that support various facets of health. 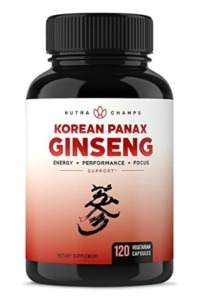 With a minimum of 5% ginsenoside, this Korean Panax ginseng from NutraChamps is sure to boost your mental fitness. It is harvested from ginseng roots that have grown for 4-5 years and hand selected to ensure only the most potent roots make the cut. Each of the capsules is non-GMO, gluten-free and vegan-friendly. There are no additive fillers or chemicals used in the process. To increase your mental performance and positive energy, you can start by taking 2 capsules of ginseng extract on a daily basis. MAV Nutrition has a simple goal of enabling people to discover a path to health and happiness. It does so by producing supplements that are carefully formulated with natural ingredients that are targeted on various individual health needs. Only matured ginseng roots are potent for boosting mental performance. 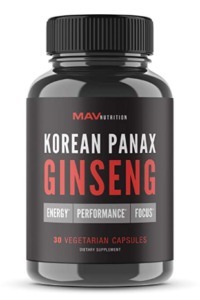 MAV Nutrition ensures only ginseng roots that have matured in the Korea region are used in making the supplement. Its medicinal properties are evident in its ability to reduce stress and fatigue. While the ginseng roots are sourced from Korea, the manufacturing took place in the US in a GMP-certified facility. The capsules contain no traces of preservatives and banned herbal ingredients. The pure ginseng extracts will work wonder in rejuvenating energy level and improving your mood. Sourced from mature and potent Panax ginseng roots. Improve energy, clarity, and focus. MyHerbtonics is united with a single goal, to produce innovative products using the finest ingredients. To support its ambition, the company ensure that due diligence is done with in-depth research before a product is formulated. It intends to produce supplements product that is more superior than its competitors. Only the finest red Panax ginseng are sourced from the farmlands in Korea for this supplement. The roots are hand selected to ensure they are of high potency. This enables individuals to experience an immense energy boost and improved mood from the ginseng capsules. Each bottle contains 120 vegetable that is made to be swallowed easily. They are vegetarian-friendly, non-GMO and gluten-free. The supplement is produced without any use of fillers or harmful chemicals. To start benefiting from the medicinal properties of Panax ginseng, it is recommended that you take two capsules daily. non-GMO, gluten-free and produced in a GMP-certified facility. Some individuals did not experience positive effects. aSquared nutrition is a leading nutritional supplement manufacturer in the US. It prioritizes on delivering quality and reliable products to its customers. This means each of its products is manufactured in FDA approved GMP-certified facilities and went through stringent testing. This bottle contains pure Panax ginseng extract that is sourced from the finest farms in Asia. They are specially formulated in a 4:1 extract ratio for maximum potency. The extracts are presented in veggie capsules that are easy to swallow. Each capsule contains 500 mg of Panax ginseng extract and it’s recommended to take two capsules daily. The capsules are non-GMO and free from harmful toxins. You’ll find that it helps to alleviate stress and anxiety when incorporated as a natural supplement. No significant positive effect on some individuals. GreeNatr is a firm believer that the key to supporting healthy living lies in the power of Mother Nature. As such, it has been using only the best ingredients to produce high-quality health products. Not only that, it is committed to sustainable earth by partnering with related non-profit organizations. This bottle of tablets not only contains the extract of Panax ginseng but also the powder and extract from Ginkgo biloba. The formula is standardized to 24% ginkgo flavone glycosides and 6% terpene lactones. 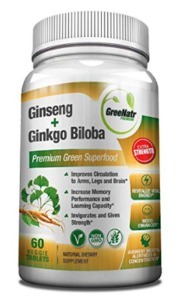 The mental boosting properties of ginseng are further enhanced by Ginkgo biloba which improves mental function. The tablets are made from all natural ingredients and they are non-GMO, gluten-free and vegan-friendly. Taking the tablets as per recommended servings help to increase oxygen and nutrition absorption in the brain. It’s a great choice for busy professionals who wish for a quick boost in mental energy. Combination of Panax ginseng and Ginkgo biloba. Toniiq believes that superior nutritional supplements are required to provide an elevated living. Its formulas are crafted from the best ingredients sourced from all over the planet. Each of its products is manufactured to provide an edge in potency to deliver superior results. The Panax ginseng extract in each capsule contains what is arguably the highest amount of ginsenosides at 80%. This means that the capsules are of higher potency than most competing products. Taking two capsules daily helps to boost mental energy and promote clarity. Only all natural Panax ginseng that is ethically sourced made its way to the capsules. They are manufactured in an FDA registered facility that is in strict compliance with GMP. Absolutely no traces of additives and harmful chemicals can be found in the capsules. non-GMO, gluten-free, and manufactured in GMP-certified facilities. May not work for some people. Founded in 2016, Sash Vitality is a relatively new health products online company. The business was started as the founders started a quest to seek natural remedies to aid their niece who was diagnosed with Acute Lymphocytic Leukemia. It is undeniable the Panax ginseng offers great medicinal properties. But it would mean nothing if the ginseng compound has a poor absorption rate. This is why these capsules are added with ginger and black pepper to enable your body to absorb the ginseng powder with ease. The powder was produced from Panax ginseng that has been growing for at least 6 years. This ensures a high potency of the ginsenoside of 10%. They are manufactured in a GMP certified facility to ensure the purity is not compromised. Taking 2 capsules daily is sufficient to reduce stress and enhance your mood. Enhanced with ginger and black pepper for increase absorption rate. Teraputics is a family owned business that started in 2009. It is committed to producing high quality and potent products to its customers. Such commitment has produced a series of best-selling supplements that are sold in more than 30 countries around the world. The capsules are formulated with 4:1 ginseng root extract that results in maximum potency. The roots are harvested from the finest ginseng farm in Asia. The manufacturing process took place in a GMP certified facility in the US. No additives are used in the process. It is suggested that you take 2 capsules daily to enjoy a boost in mental clarity and mood improvement. As it is made of 100% pure Panax ginseng, you won’t be experiencing side effects that are caused by fillers or chemicals. Manufactured in a GMP-certified facility and lab tested. Some individuals experience side effects like facial flushing and jittery. 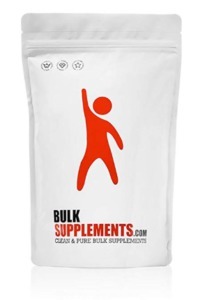 BulkSupplements operate from its cGMP certified facilities in Nevada and is staffed by over 40 employees. It produces more than 400 nutritional supplements to a huge number of customers and manufacturers. Product safety is important and every batch of supplements are tested in-house before being delivered. If you’re not a fan of tablets and capsules, BulkSupplements offer a decent alternative in Ginseng root powder. They are extracted from Panax ginseng harvested from farms in Asia. The powder is lab-tested to be free from additives and harmful compounds. 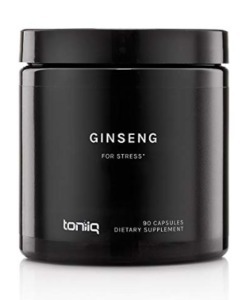 Panax ginseng powder offers a form of natural stress-relief. You can take 1/2 teaspoon up to twice daily and observe how your mood improves. The powder contains 5% of ginsenosides, the active compound of ginseng associated with medicinal properties. If the taste is overwhelming, you can mix it your favorite drink. Increase endurance and positive mood. Produced in GMP certified facilities and lab-tested. The taste may be unbearable for some individuals. 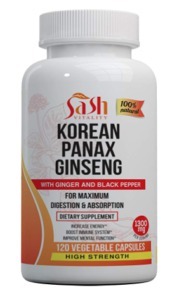 Whether you’re trying to destress effectively or improve cognitive function, I hope this list has helped you in shortlisting the ideal Korean Red Panax ginseng as a supplement.